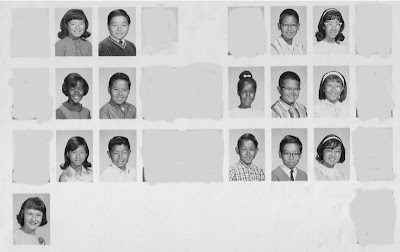 Yesterday I showed you my 3rd grade class picture, including Mrs. Wilson, one of my favorite teachers. Today we go forward three years to the 6th grade and my class picture from Mrs. Capps' class. Mrs. Capps was my favorite teacher of all. What's with the mangled picture and all the white out? No, it's not enemies whose memory I wanted to eradicate from my brain, it's pictures of another class that they combined with our picture. The picture studio botched this one. Our class was by no means this small; they must have lost more than half the pictures and I am very upset about it but what's a person to do? What's done is done. Sterling Tom (he's in yesterday's picture also) and I were invited to attend a different elementary school in the 6th grade, an "accelerated" or "gifted" class. Mrs. Capps was the teacher. Most everyone else in the class had her for their 5th grade teacher as well, during which time she was Miss Hansen. What made her my favorite teacher? She was nice. She taught us a lot. She cared for us and treated us with respect and never talked down to us. But that is true of a lot of teachers; with Mrs. Capps, something just clicked, is all. I would say something clicked for a lot of us because if you were to ask my classmates who their favorite teacher was, I bet most, if not all, would also name Mrs. Capps. Like I said, that's less than half the class but unfortunately everyone else is missing. I have many fond memories from this era, which I'll write about in upcoming posts. Many of the students from her class went on to do some great things. As for me, well, I sort of feel like were I to meet them now, it would be like the scene painted in Harry Chapin's Taxi, with me as the cabbie.